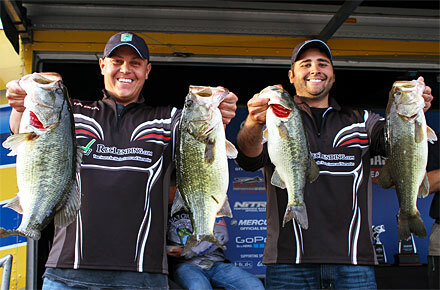 Tim Eaton (left) and Chris Risner of Michigan weighed 24 pounds, 13 ounces on Day 2 of the Toyota Bonus Bucks Bassmaster Team Championship on Lake Guntersville to claim the victory with a two-day total of 48 pounds, 7 ounces. Photo Credit: Ronnie Moore/B.A.S.S. Even some things they never could have imagined. The Michigan anglers, who qualified for the event through their home state's D&R Sports Center Tournament Trail, caught five bass that weighed 24 pounds, 13 ounces and claimed the national team championship with a two-day weight of 48-7. Two of their best fish came around mid-morning on one magical cast. "Chris had just finished telling me that he needed me to catch an 8-pounder," Eaton said. "Then on the very next cast, I got a bite and set the hook. I couldn't believe it. It was 8 pounds of fish, but it was two of them on the same bait — a 5-pounder and a 3-pounder. "That's when we started to feel like maybe it was just meant to be. This is our biggest dream come true." Risner and Eaton finished just ahead of the Texas team of Dean Alexander and Thomas Martens (46-10) and the Louisiana pairing of Nickolas LeBrun and Randy Deaver (45-4). Now the six anglers from the Top 3 teams will compete individually against one another on Saturday in a fish-off. The winner will earn a bid to the 2016 GEICO Bassmaster Classic presented by GoPro on Oklahoma's Grand Lake O' the Cherokees, March 4-6. Risner and Eaton said they might have been aided by the heavy fog that forced the postponement of the second round Thursday. During the fog delay, they sat at the dock worrying they might not be able to put together a good limit if the anglers were sent out to fish a shortened day. "I truly think that it helped us, because I don't think the conditions were right for how we wanted to fish," Risner said. "We sat there and talked about it, and we felt like if we only had four hours to fish, we didn't know if we could get it done. "It was taking us the full day to get a big bag. That's what it took us today, and we were fortunate to have it." Excitement and nervousness was obvious for both anglers during Friday's award ceremony. Risner even complained of his hands cramping because he had gripped his winner's trophy so tight. During Saturday's Classic fish-off, they said they'll share the spots they've fished as a team all week and fish without pressure. "This is what we came here for," said Eaton, gesturing to the trophy he was awarded for the team title. "Anything else that happens from this point on is just extra. If one of us is going to win, I'd honestly rather it be Chris." The format will change radically now as the tournament shifts to an individual competition. Three anglers will fish in their own boats, while their team members move to Nitro Boats provided by B.A.S.S. The Classic fish-off was originally slated for Friday and Saturday. But since Thursday's round of team competition was wiped out by fog, the fish-off has been shortened to one day with two separate sessions. The six anglers will leave Lake Guntersville State Park at 6:30 a.m. Saturday and return to the park for the day's first weigh-in at 10:30 a.m. Then as soon as the morning weigh-in is completed, they will go back onto the lake for a second four-hour session. They'll be allowed five fish for each session, and the angler with the highest total weight at the end of the day will earn a Classic berth. "Several things played into the decision to do it this way, including the threat of severe weather Sunday," said Jon Stewart, tournament director of the Team Championship. "Instead of stretching it to Sunday and fishing two more days, we're basically going to have two tournaments on one day." Unlike the Team Championship where landing nets were allowed, anglers will be forced to hand-land their bass in the fish-off — just as anglers on the Bassmaster Elite Series do all season. Team members will be forced to decide among themselves Friday night who will start where and how all of their best spots from the week will be divided. "We'll discuss it tonight, and however it works out is however it works out," said LeBrun on the subject of fishing against Deaver, his Louisiana teammate and friend. "At the end of the day, we're still going to be best friends — and that's all that matters." See Full Tournament Results on the forum. B.A.S.S. is the worldwide authority on bass fishing and keeper of the culture of the sport. Headquartered in Birmingham, Ala., the 500,000-member organization's fully integrated media platforms include the industry's leading magazines (Bassmaster and B.A.S.S. Times), website (Bassmaster.com), television show (The Bassmasters on ESPN2), social media programs and events. For more than 45 years, B.A.S.S. has been dedicated to access, conservation and youth fishing.